The origin of common land as we know it lies in the communal farming arrangements of the feudal system. Before the easy availability of land drainage, there were always areas of farmland that were less productive, and difficult to improve. This ‘wasteland’ provided the essentials of life – food, water and fuel. Although it is often thought that land was common to all, or that some has no owner, since there has been an organised society in this country, all land has belonged ultimately to the Crown. The feudal system of the middle ages gave rise to a communal farming system, consisting mostly of arable in strip fields, and associated common or wasteland. Animals were grazed over the arable once the crop was harvested, and the common land was accessible to tenants of the lord of the manor to provide further grazing. These arrangements were regulated by manorial courts. The first English Statute (of Merton) referred to Commons and was passed in 1235. There is evidence that unfenced or ‘open field’ farming was practiced in England during the Roman occupation. The feudal system came to maturity between 850 and 1150, and the comprehensive survey of the system in the Domesday Book of 1086 provides the best documentary evidence of its workings. The structure of landholding at the end of the eleventh century after the Norman Conquest, which had adapted the pre-existing common system, was that the lords held land of the king, and provided military services to the Crown in return. Most of the land was then let to tenants to farm, while the lord himself might keep some land ‘in hand’ to be farmed on his own behalf and for his use, known as ‘demesne’ land. Tenants had rights to use the land for farming, grazing and the taking of wood and fuel, and these rights were associated with the tenancy, not the individual. These rights could be passed from one generation to the next through the copyhold system, where each change of tenant was effected by a change to the copy of the court roll. Some tenants of the manor were ‘free’, and not bound to provide military service to the lord of the manor. In order to cope with the variability in land quality and the limitations of the existing crops, tenants were allocated scattered strips of land in the large common arable fields, and cropping and harvesting decisions were made communally. There had always been old inclosures near settlements (‘tofts’ and ‘crofts’), though the majority of a settlement’s agricultural land would have been subject to communal farming. Crops were rotated, with one of the two or three fields being left fallow each year to recover its fertility. Individual or groups of strips were not to be fenced, and animals were kept off the cropped field until everything had been harvested. In addition to the strips in the common arable fields, tenants were able to turn their animals (cattle, pigs, geese and so on) out on the unimproved commons and wastes of the manor. It must be remembered that, before the introduction of fodder crops and new improved varieties of existing crops, the main difficulty facing any farmer was how to provide food for livestock during the unproductive months of winter and early spring, and the common provided trees to be pollarded for early young leaf growth for livestock, and an early ‘first bite’ on flooded or ‘water’ meadows, where tenants had ‘lots’. How many animals, how much turf, furze or wood could be taken was determined by the manorial court, and this closely related to the resources available. Access to these common resources was generally limited to animals that belonged to common rights holders and ‘stints’, relating to both numbers and certain times of the year, were introduced to ensure that commons were not over-exploited. Those who abused their allocated rights could be reported to the court, and punished. While manorial courts gradually fell into disuse during the 18th century, the major changes followed from the introduction of new fodder crops in particular, and cheap and effective land drainage, usually using manufactured tiles. Over time, some holders of strips would agree to stop enforcing their common rights against each other, and physically enclose individual or multiple strips of land with hedges or fences. This allowed them to improve their own holdings as they wished. In some instances, legal agreements were made between land holders in the open fields to ensure that the common rights were extinguished and the land was put into ‘severalty’, or unrestricted individual ownership. The process of inclosure had gathered momentum in Tudor times, in response to the growth of the wool market, and gained a bad reputation for depriving landless labourers of a living, by turning what was mixed farmland to pasture for sheep, with much lower requirements for labour. This was particularly the case in the English Midlands. By the 18th century, legal agreements were being superseded by Acts of Parliament, particularly where the lord of the manor wished to drive improvement in the productivity of the manor’s agriculture, or there was pressure from the tenants. The increased investment improved yields and allowed an expansion in population, which in turn prompted more innovation to produce enough food. The Europe-wide Napoleonic Wars of the early 19th century also highlighted the vulnerability of the country’s food supplies, and a great deal of Parliamentary inclosure took place in the following years. By this time, waste of the manor, roadside strips, as well as commons and cow downs, were being inclosed, and the landscape of those areas affected changed, as smaller hedged fields replaced the large strip-fields. Many of the very late inclosures were purely of commons. Three Acts of Parliament were passed: a General Act in 1801, incorporating many of the frequently used clauses; another General Act in 1845 which served to further standardise the process, and made it simpler and less costly; and the Commons Act of 1876, which left the Inclosure Commission responsible for proposals to regulate commons. The Statute of Merton of 1235 had previously attempted to do this, ruling that lords of the manor could inclose commons, provided that the common rights holders had sufficient land to properly exercise those rights. The commons were later to be inclosed than the arable, partly because the returns from improving the common arable fields were greater, but also because it was easier to inclose fields with their strips, where the owners were identified directly with land parcels. Holdings in commons were less easy to identify, particularly where the manorial court system had fallen into disuse. It was more usual to record the common rights rather than the acreage of the land, so it is difficult now to identify the extent of many commons. It is also the case that many commons were encroached upon piecemeal over a long period of time, and the encroachers were eventually allowed to rent their holdings. This may be the reason why a number of commons were never inclosed at all. A report of 1874 by the Copyhold, Inclosure and Tithe Commissioners attempted to collate the acreages of commons in the country, but there are difficulties with the figures recorded. Against this background, the Commons Registration Act (‘CRA’) of 1965 attempted to collate information about commons and the rights over them. Under the provisions of the CRA 1965, any land in England and Wales capable of being registered ceased to be a common unless it was registered, with the same applying to any common rights. Any land not so registered within the time limit ceased to be common or carry any common rights. All those registrations that were processed under the Act that were ultimately undisputed were registered under section 10, forming conclusive evidence of registration. The maps and registers produced are kept by county councils, unitary authorities and the London boroughs, and are available for public consultation. Section 1 of the Countryside and Rights of Way Act 2000 defined registered common outside Inner London as ‘access’ land, thereby allowing public access for the purposes of open-air recreation (section 2). Section 193 of the Law of Property Act 1925 also provides for public rights of access for air and exercise on manorial waste or commons. Further provisions to improve the registration systems were introduced under the Commons Act 2006, though not all sections have been enacted in all parts of the country. The origin of the town or village green lies in customary rights. They were open spaces in towns and villages for communal activities. Though technically originally a trespass, or carried out with the permission of the Lord of the manor, these rights became customary and enforceable through the courts. Many greens would have been subject to rights of common, particularly of pasture. Those never subject to any common rights would have been part of the manorial waste lands and, in the 19th century, it was the practice of Inclosure Commissioners to allot parcels of land in a town or village for recreation, when land in a manor was being inclosed. These greens are often subject to customary rights for leisure or other purposes. Town and village greens do not all have the same origins and therefore they do not necessarily all carry the same types of rights. The CRA 1965 allowed for town or village green rights to be claimed over land, provided the required legal tests were met. The Act identified three classes of greens, those that were allotted through inclosure for recreation, those originating in customary rights, and those on which lawful sports and pastimes had been carried out for more than 20 years by a significant number of inhabitants. Under section 15 of the Commons Act of 2006, only the last type of greens, depending on evidence of recent use, can be registered. Once registered, there are restrictions on driving and building on village greens. 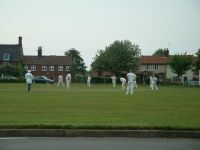 The traditional view of a village green is a mowed space on which cricket matches are played, and maypoles are danced around, with well-placed benches, serving as a meeting place and forming the heart of a town or village. Recent applications have shown that other settings are land over which such rights can be registered, and include beaches and land in housing estates.